I’m a small business owner, and technician, and usually carry a laptop everywhere I go. Lately though I’m using my tablet for business much more and leaving the laptop turned off. If you’re thinking of getting a tablet for business or have one now and want to use it for more than just books and games, here’s how I’m using my tablet for business. I picked up a 10 inch Lenovo Ideapad K1 tablet a while back specifically because the question was, “What can you really do with a tablet?“. I can’t say for the 7 inch screens, however a 10 inch screen is a great size for viewing and typing and facilitates activities that your phone screen are just too small for. Yes, it’s bigger and no it doesn’t fit in a pocket or purse, but I find it’s a good size. I have a Samsung Galaxy S smartphone running Android and no Apple products apart from an AppleTV. I’m also a tech who likes to have the flexibility to tinker with the OS and choose my apps. It made sense to stick with the Android OS. My company is small and so I can adapt more easily to new technology and change company processes and standards as opportunity comes along. The K1 tablet runs Android as well and has now pushed me to embrace the Google environment since it is tied in so nicely. I’m at the point that if I really wanted to, I think I could eliminate Outlook and the Microsoft Office Suite, almost…. The 10 inch screen size on the K1 is big enough that I can almost touch-type on it. I could get a bluetooth keyboard I suppose but that’s just one more thing to carry. I’m getting better at typing on the tablet without that sensory feedback of pushing a keyboard key. 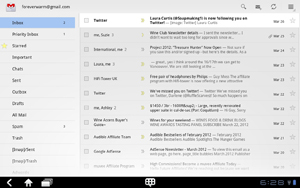 The Gmail App on the Ideapad K1 slick and the 10 inch screen makes for easy reading. Spam gets pushed aside to its own folder and Google does a pretty good job of determining what is Spam. (I always check before deleting, just to be sure) Creating emails is intuitive and as I mention above, typing is pretty good – especially in landscape mode, which is how I normally work. Start typing a contact name and the Gmail App offers suggestions you can pick. A folder structure can be created and dragging emails to a folder is easy enough by just press-and-hold, then drag – a feature that works in many places on the K1. I now use the Google Calendar to track my customer visits throughout the day and record my activities while there. Later I copy/paste that information into Quickbooks for billing. (It is easier to do that on a computer – imperative in fact, since Quickbooks will not run on the tablet). There are a few time tracking Apps I’ve seen that will let you port the entries into Quickbooks but I haven’t seen anything I liked. 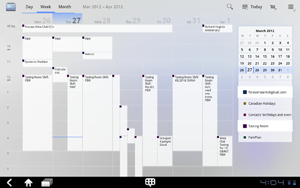 Viewing your calendar on the Ideapad is delightful due to the screen size. I typically have the view on week-mode and can see appointments and details. Creating appointments is easy. The only complaint is that the description field is very small and I use this area to write my activities, which can be fairly detailed. I also have access to other Shared Calendars, which you can see on the right, and it is very effective to be able to see them all, or toggle off the ones I don’t need to see right now. I can quickly see my schedule in comparison to other things going on. It’s very much like collaborating on Microsoft Exchange – without Exchange. I’ve used Google Docs now and again in the past but until now have never really embraced it. Now, having a tablet, I use it a lot! The ability to be at a customer site and quickly check their documentation without waiting 5 minutes for my laptop to power up is effective use of time. From that same customer, or my local coffee shop I can make quick updates as needed. I keep the documents in Google format and do not try to convert back and forth to Microsoft Word. I want it simple without a lot of uploads/downloads. I also want to be able to edit wherever I am without restriction. If I really need to I can download to Microsoft doc format and would only do this if I need to send that document to someone who’s using MS Word. The Ideapad K1 does have a Google Docs App, however it will not allow you to see formatted tables, which I use a lot. Instead I use the web-based version which is still very acceptable and easy to read and edit. Google please update this App! 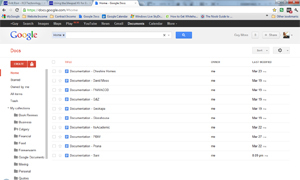 I think that little web-based Google Tasks that pops up on the side in Gmail is pathetic! Fortunately the Google Tasks App on the Ideapad is much better. You can have five full-screen pages of tasks which you can filter by category. Assign dates, or not, and check them off when completed. It’s much easier to work with and as a Getting Things Done proponent I use tasks A LOT! I’ve pushed aside the standard square menu box that Lenovo has made default on the home screen of the Ideapad K1. Instead, my home screen has three Widgets: the Gmail widget, the Calendar widget, and the Tasks widget. They are expanded to fill the screen and give me an immediate quick overview of what’s going on and what might be coming up. On a different page I use the Bookmarks widget to show my most-used pages and this give me quick access to those. One a third page I have the AccuWeather widget to track cities across Canada and I downloaded the Analytics widget that shows me Google Analytics visitor totals on various websites, plus icons for the other things I use. The right widget makes all the difference. I recommend browsing the included widgets on the tablet to see which ones will help make you more effective. I still need and use my laptop, so it needs to be synchronized to my other devices. I would have thought that Google would create a program for my desktop to automatically sync from Outlook, however I had to go purchase a 3rd party program. I’ve been using gSyncit and so far have been pleased. 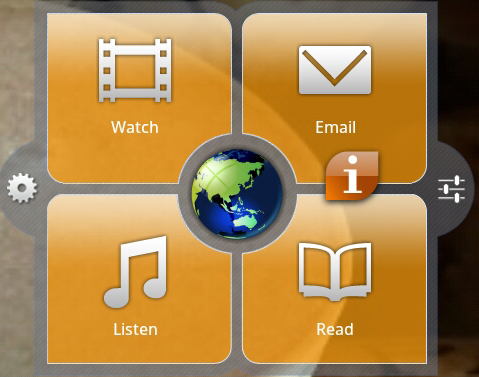 Using a tablet for business has given me an instant-on device with access to the things I use the most. What I wanted was the same information (Contacts, Calendar, Tasks, Documentation) on every device so that there’s never any question of, “am I looking at the most recent version of this?”. My computer, smartphone, and tablet give me full access to the same content and a change on any one, updates the others. What about you? Are you using your tablet for business? What works for you? Be the first to comment on "Using the Ideapad K1 for Business"